To practice using a different feature of OpenSCAD, I tried making a wine glass by rotating a 2D outline around the Z-axis. OpenSCAD has much more limited 2D capabilities than SVG, allowing only polygons, not smooth curves, so it took me a while to come up with a way to get a decent shape with just a few vertices. The tiny wine glass looks ok, but the single-layer walls of the bowl leak, and the stem is too springy. 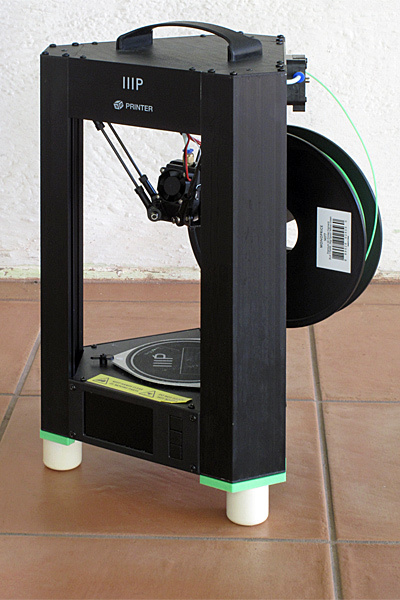 My first design was based on a tall, thin wine glass, but the glass was too tall for the print volume of the Monoprice Delta Mini printer, so I tried printing it scaled down by a factor of 2. The printer had a lot of trouble with this tiny design. 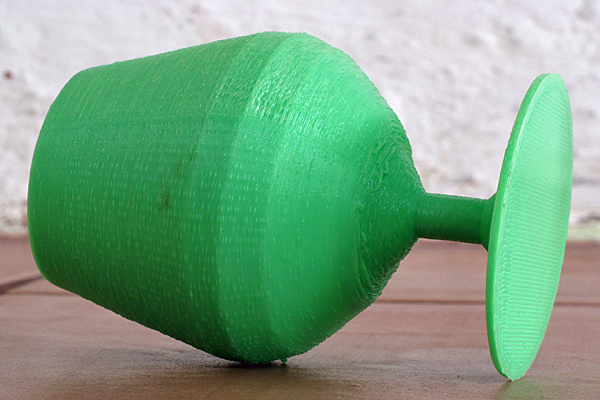 Perhaps the biggest problem is that the thin stem is too flexible, so the printer head dragged the bowl around as it was printing. The stick-slip action resulted in a few small holes in the single-layer bowl. I then tried adjusting the design so that the default settings would still produce the wine glass, but different settings would match a mini-snifter that does fit in the print volume. This mini-snifter has a bowl volume of about 135ml (4.5oz), and the snifter weighs 33g. I printed it at 0.15 mm/layer, with a wall count of 5 in Cura, 6 top and bottom layers, and 10% infill. The roughness of the surface is probably due to inconsistent feeding of filament, except where the bowl flares out widely. 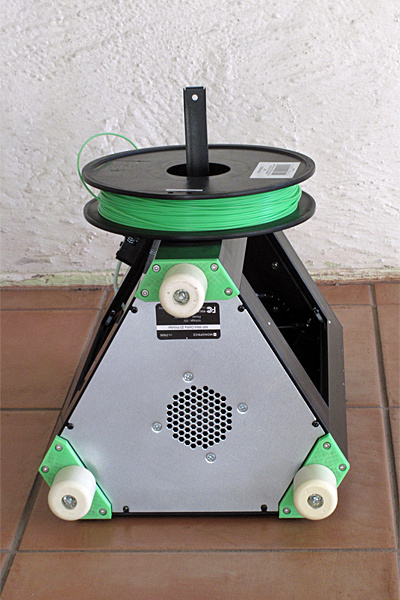 There the filament is drooping a bit due to insufficient support. The mini-snifter holds water and is a reasonably close approximation to the glass that I was copying. 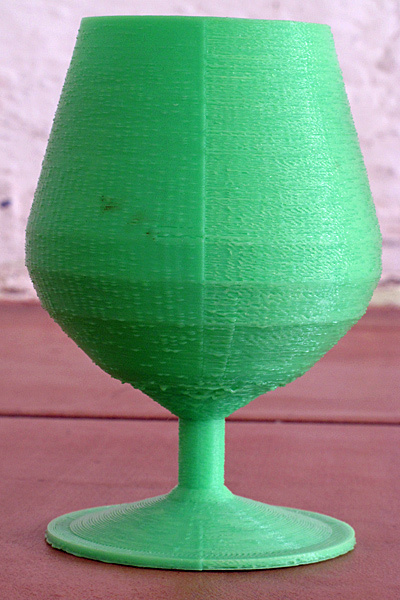 Side view of the snifter, showing the “seam” that results from Cura starting each layer by moving to the same starting position on the circle. Bottom view of the snifter, showing the flat surface created by the glass bed added to my printer. Inside view of the bowl of the snifter. 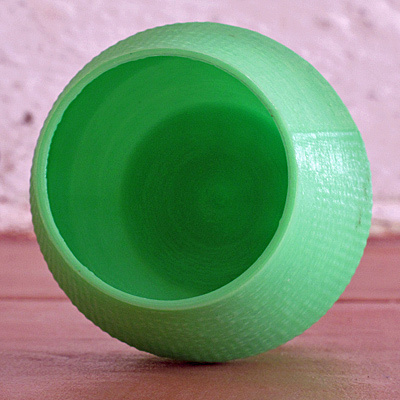 Snifter on its side, to show the roughness of the printing where the bowl widens unsupported. The vertices of the polygon that is rotated are also clearly visible here as three lines around the bowl. // thickness is thickness of sides of bowl. // The default example is for a small snifter, with an interior volume of about 135ml. 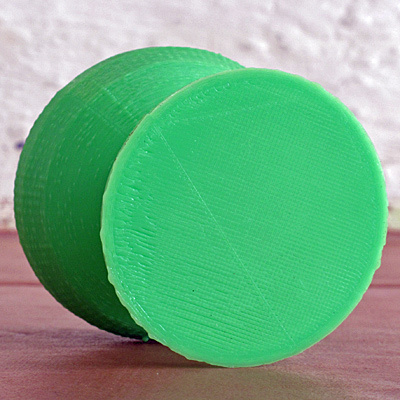 // Printed in PLA with 0.15mm layers, wall line count 5, top and bottom layer count 6, and 10% infill, it weighs 33g. I designed the threads using OpenSCAD, which has no built-in support for creating helical structures like threaded rods and sockets. I found an open-source thread module on the web, but I found its parameterization awkward, so I ended up writing my own. Here are my practice pieces for designing threaded rods and sockets with OpenSCAD, and printing them on the Monoprice Delta Mini. 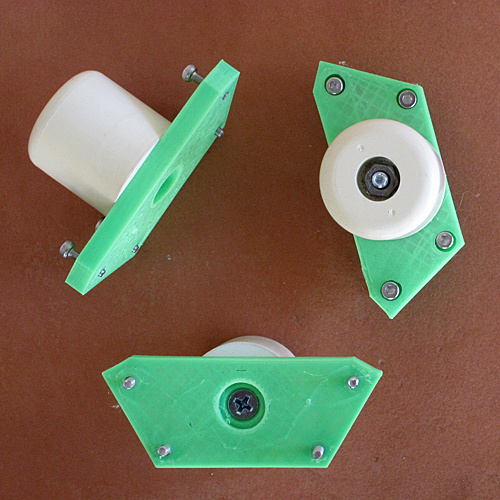 All the test pieces were printed with the threads spiraling around the vertical Z-axis, to minimize the amount of unsupported filament. 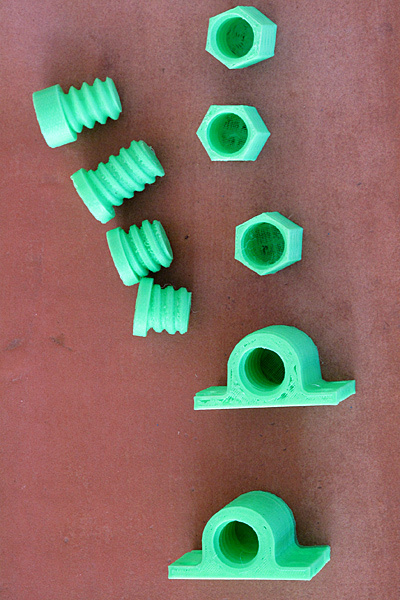 The undersides of the threads are a bit rough, but the roughness can be minimized by making the threads have a nearly triangular profile, so that only a little bit of filament is unsupported in each layer. The first threaded rod, at the top left, screws easily into a broom head, and has fairly smooth surfaces, but was a bit too loose (diameters a little too small) and only a rather thin part of the thread was taking most of the contact force. The second one was sturdier, but still too loose. The third one was too fat and would not screw into a broom head, but the fourth one was a good fit, screwing in easily, but not being wobbly. The first two sockets worked with the first two printed screws, but not with the steel threads on my broom sticks—there was not enough clearance. The third one fit fairly well and had smooth threads, but the threads were rather thin, and I felt they would not be sturdy enough. 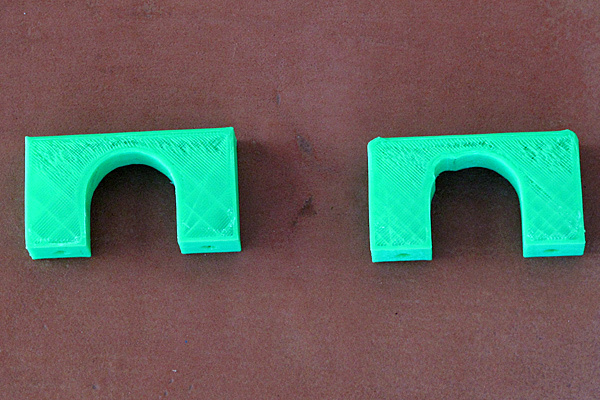 The two sockets with plates were beefier, and were experiments in seeing whether I could print horizontal screw holes. 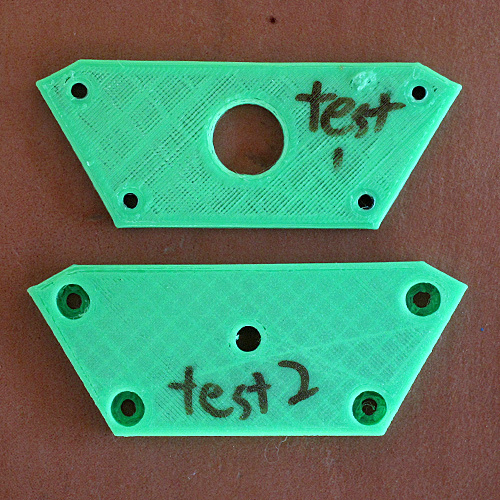 I printed holes for #8 and #9 flat-head screws (countersunk), and the bridging did not cause problems with loose filaments. I did have a little problem with the flat plates not printing properly, which I tracked down to the glass plate on the bed rotating a little in the clips (pretty much as Michael Johnson had warned me). 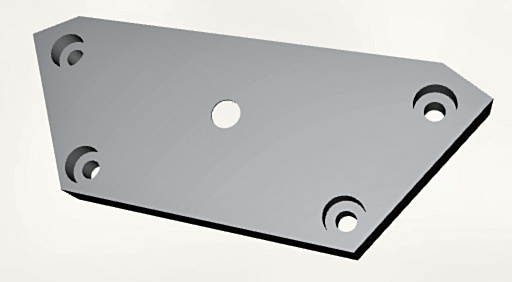 I fixed the problem by adding some dabs of hot-melt glue to hold the clips to the plate. I have renew the hot-melt glue every few prints, since it does not bond the glass and the PLA permanently, but I find that an acceptable tradeoff for the ease of removing prints from glass rather than the bed that the printer comes with. 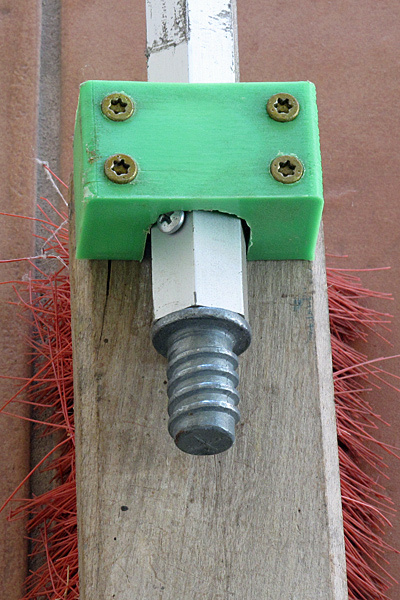 Here is the final socket attached to the broom head with 1″ #8 wood screws. 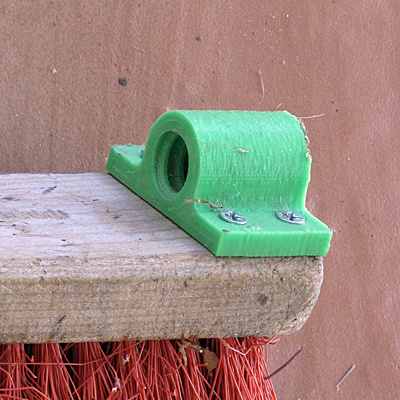 Of course, one socket at the end of the broom head would not be very secure—the length of the broom head makes a pretty big lever arm for twisting, and PLA is not that strong a plastic. So I designed a support for the broomstick at the other end of the broom head. I could, perhaps, have used a commercial conduit strap, but the screw holes in them are a bit far apart for screwing to the broom head, so I made one that fits the broom handle I’m using precisely. Here are the practice pieces I made, to make sure that the broom handle would fit and to check that I could make long screw holes. Note the notch on the right-hand example. The first test piece held the broomstick well, but did not allow the broomstick to be inserted and withdrawn easily—there are a pair of screws on the brookstick that hold on the threaded end, and the screwheads stick out a little. The notch in the second test piece was carefully designed to just allow the screwheads through, but I added 1mm more clearance for the final piece. The test pieces were printed with thin shells and 10% or 20% infill, and so were very light, but I printed the final pieces with thick shells and high infill (50%? ), so that they ended up fairly solid. 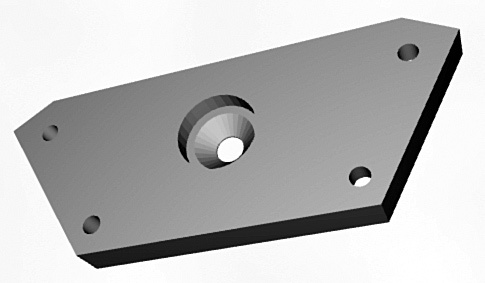 The screw head on one side fits through the notch, and on the other side is in the diagonal space left by extending the circular hole to form a U. 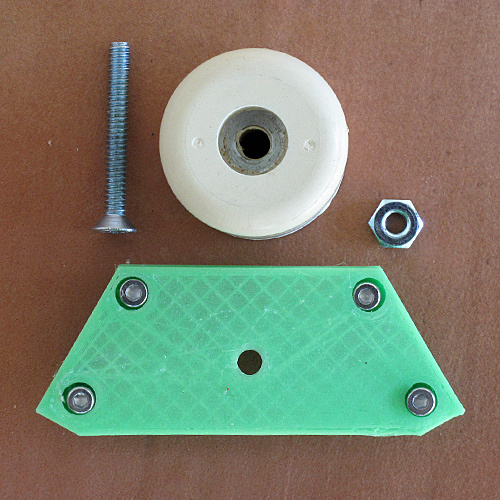 The block is held in place with 2″ #9 deck screws. Although the deck screws were supposed to drill their own holes in the wood, I found that I had to drill pilot holes for them—the first one I inserted split the wooden broom head, which I had to glue back together. 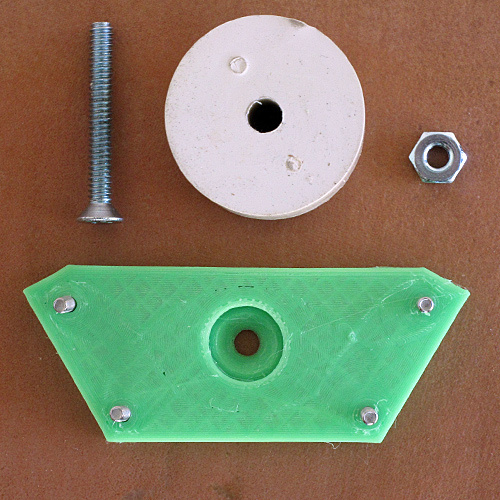 I also made a mistake in printing the U-shaped piece with the screw holes horizontal, as torquing down the last screw started to split the plastic along the laminations. 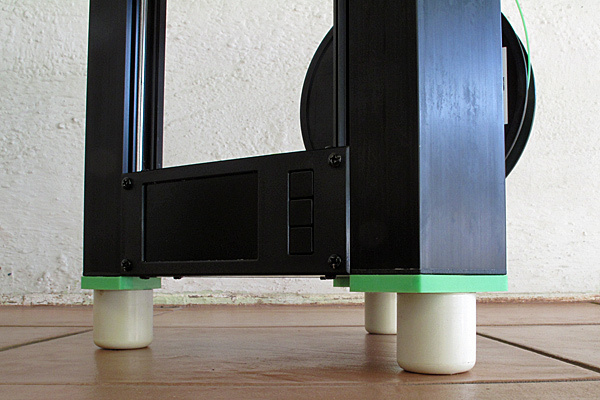 If I were to reprint it, I would print it “legs-up” so that the deck screws compress the laminations together. Here is the finished roof-valley sweeper, mounted on the telescoping pole. 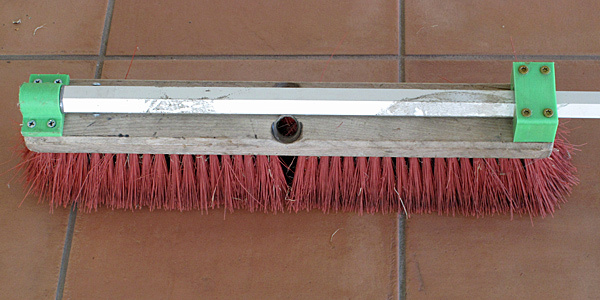 The broom head is still usable as an ordinary broom, as the extra hardware does not interfere with inserting a broomstick in the normal way. I used the roof-valley sweeper today to clean one of the roof valleys on my tile roof (the one reachable from the porch roof). It worked well to remove a year’s accumulation of leaves and twigs, though I’ll probably have to use it again this fall, after the trees have shed their leaves. I still have the other roof valleys to clean, which needs to be done with the telescoping pole from a ladder. I don’t expect the PLA pieces to last forever (this is not UV-resistant material), but I store the broom head in a dark garage, so I expect to get a few year’s use out of them. // perpendicular to the thread. // Threads start at z=0 on the x axis. // but bloats diameters and threads. 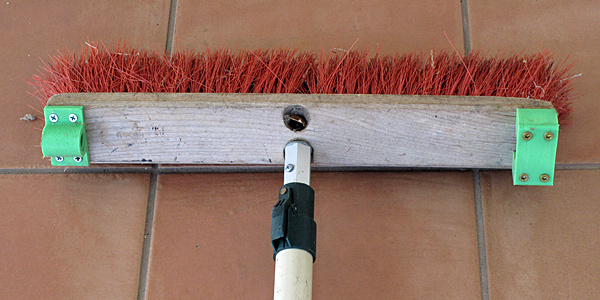 // create an acceptable socket for the broom handle. // cylinder has axis along z-axis. // Plate is parallel to xz-plane on positive y side. //   an extra "fillet" mm wider on each side where it touches the plate.